The Adjustor is a unitized in-floor pit enclosure that allows access to refrigeration, electrical, plumbing, pumps and many other mechanicals. Its unitized construction provides for a One-Step installation that’s fast and easy, reducing your labor cost. Installers like its workability and ease of handling. Cutting penetrations will not compromise the liner strength. 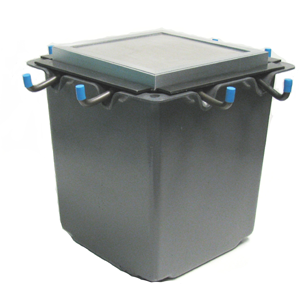 No special site preparation is needed, just place the unit on a solid substrate base that’s free of piercing objects. Securing rods stabilize the unit until back-filled and the concrete floor is poured. 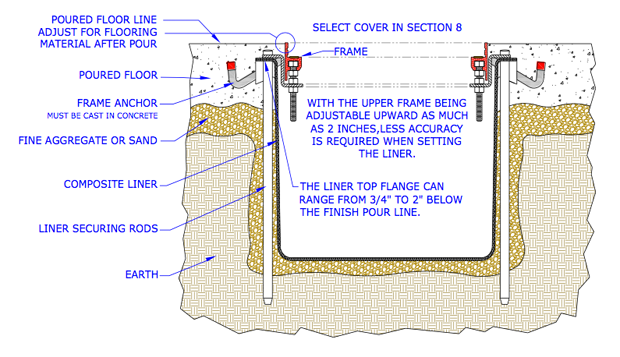 Positive alignment of the liner is not necessary when setting since the aluminum frame can be adjusted to fine tuned for uneven floors and flooring material by raising and leveling to match floor conditions. steel or lightweight aluminum and then finished to match any type floor covering. Liners are offered in almost unlimited selection of sizes from 12″ x 12″ x 15″ deep to 60″ x 60″ x 36″ deep. Other sizes are available upon special request. 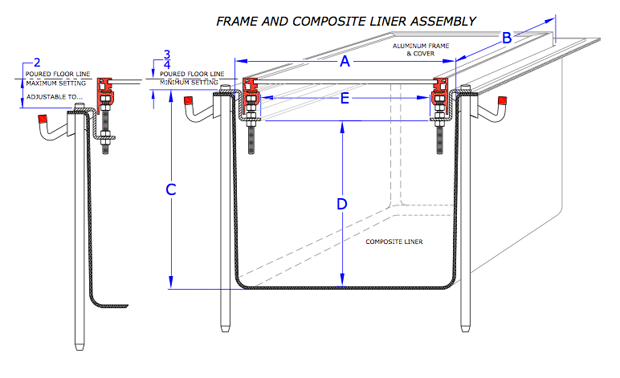 Liners are available in six inch increments in any direction. Interior Width or Length of Composite Liner "A" or "B"
Nominal Size 12" 18" 24" 30" 36" 42" 48" 54"
Actual Size 12-13/16" 18-3/4" 24-7/8" 30-3/4" 36-11/16" 42-5/8" 48-9/16" 54-1/2"
Nominal Size 60" 66" 72" 78" 84" 90" 96"
Actual Size 60-7/16" 66-3/8" 72-5/16" 78-1/4" 84-3/16" 90-1/8" 96-1/16"
Overall Depth of Composite Liner - "C"
13" *15" 18" 24" 30" 36"
Useable Depth of Composite Liner - "D"
10-3/4" *12-3/4" 15-3/4" 21-3/4" 27-3/4" 33-3/4"
Dimensions may vary due to mold configuration. *12″ x 12″ is only available in 15″ depth. The Aluminum frame has an adjustment range of 2″ to allow for setting variables, unevenly poured floors and floor covering materials. Installation of unit can be accomplished in several ways. The preferred way takes advantage of ADL’s adjusting feature. Place and level the unit with the top edge of the finished aluminum frame even with the proposed final poured floor. This allows for concrete finishers to produce a clean and level floor around the unit’s frame. After the concrete cures, evenly turn the adjustors on the underside of the frame to raise it out of the concrete to a level that matches your choice of flooring material. An alternative method is to level the frame’s top edge to its final elevation, including the flooring material. Pour and finish the concrete to a level allowing for the flooring material.